In the crowded scene of Tuareg guitarists, Mdou Moctar stands apart from his peers. Playing in the repertoire of desert guitar popularized by groups like Tinariwen and Bombino, Mdou is pushing the boundaries of the genre with a unique personal sound. With versatile compositions and genre defying albums, Mdou's music has been an underground success with an international following, set on redefining the sound of the desert. Mdou Moctar hails from a small village in the Azawagh desert of Niger, a remote region steeped in religious tradition. As a child, he taught himself to play the a homemade guitars, cobbled together out of planks of wood. It was years later before he found a "real" guitar, teaching himself in secret. In an area where guitar music was all but prohibited, he quickly rose to the status of local celebrity amongst the village youth. In 2008 he traveled to Nigeria to record his first album "Anar." A psychedelic reworking of the Tuareg sound, the electronic tracks featured innovative pitch bending synths, drum machines, and autotune. In 2010, he teamed up with the label and collective Sahel Sounds, releasing his first international album, "Afelan." In 2015, he co-wrote and starred in the first ever Tuareg language film, "Rain the Color Blue with a Little Red In It," a Saharan remake of Prince's "Purple Rain." In 2017, he again shifted gears to another sound with "Sousoume Tamachek," a mellow blissed out recording evoking the calm desert soundscape, tackling religion, spirituality, and matters of the heart. In the past years, Tuareg rock music has gotten faster. There is a preference for this new style, both in the raucous weddings of Agadez and in Berlin rock clubs. The wavering guitar solos, rapid fire drums and heavy distortion has become characteristic of the contemporary sound. Mdou takes on this challenge, but with an ear towards tradition. Rooted in traditional, with borrowed polyrhythms of traditional « takamba » and lyrics sung in the style of old nomadic poets, his guitar playing is wild and unrelenting, equal parts nomadic bard and Eddie Van Halen. 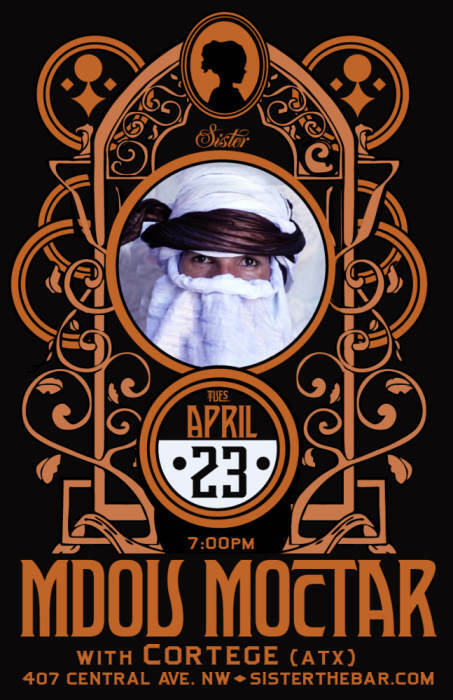 Mdou Moctar and his band have toured Europe and North America, playing sold out shows from small DIY rock clubs in Portland to New York City's Lincoln Center. His music has been featured in the BBC, The Guardian, Pitchfork, New Yorker, L.A. Weekly, NPR, Rolling Stone, Les Inrocks, and his film continues to be screened at film festivals around the world. From underground star of Niger to international film star, Mdou Moctar has undoubtedly one of the quickest rises to success. Cortége :: Cortége is the brainchild of Chicago born Mike Swarbrick. Cortége is pronounced similarly to Cortez and is the French word for procession, Mike was at one time a mortuary student. Swarbrick started out cutting his teeth in the Austin punk scene playing bass in Bass Line Bums, Riverside Riot and The Schisms. Mike met Thomas Collard (ex Thunderkeif) in the fall of 2012 and started paving the way of what would become Cortége. Cortége began playing shows and released they're debut EP in the spring of 2016. Adrian Voorhies (ex Humut Tabal, Canyon of the Skull) teamed up with Cortége in the fall of 2017. Since then, Cortége has put out their full-length s/t album and have completed 2 national tours of the midwest.